Because the inside of your home does matter. We provide interior painting services and exterior painting services in Southside Hampton Roads. 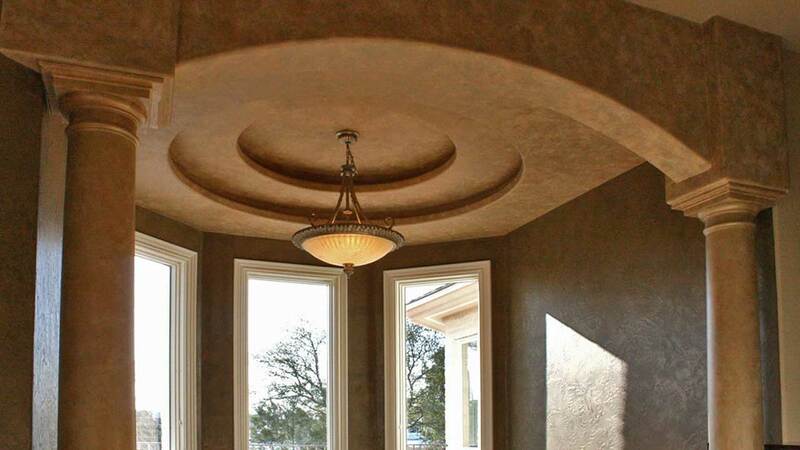 We paint Stucco and Dryvit. We also offer repairs and a full range of faux finishes. We don’t all live in mansions with gigantic living rooms. But just because a room is small doesn’t mean it has to feel cramped. When painting a small space, many people want to emphasize open space and make the room feel more spacious than it really is. There are no hard and fast rules, but different colors and patterns can influence our mood and perception. Here are some tips for using paint to open up a small space. But why worry about the details all by yourself? Even small jobs are best left to the professionals. At Wade Bros Painting, we’re committed to helping you find that perfect look. If you’re looking for a house painter service in Virginia Beach, Virginia, look no further. We paint all homes. Easy and difficult. We just show the complicated stuff here to show our skills. This is a nook in a kitchen that we painted a few years ago. We’d show you a plain white wall painted to perfection at a really great price but it wouldn’t have the drama this kitchen nook has. Bottom line. If you need interior painting. You can choose us with confidence. Our painters have over forty years of painting experience between them, and they’re committed to helping you find that perfect look. With fast, reliable service and the most competitive prices, Wade Brothers Painting is one of the top interior and exterior home painters in the Chesapeake area. Pastels. One convention you might have heard is that small rooms should use pale colors. There’s a lot of truth to this. Just remember that pale doesn’t have to mean boring. You’re not limited to whites. While bright colors seem to project off of walls, pale colors do the opposite. They draw the eye outward. Cool tones like soft greys, blues, and greens can create a natural, tranquil mood. For a cozier feel, choose warm colors like soft yellows. Match colors in the same family. This is another way to suggest more space than there really is. Chose one color for the main walls, and paint other elements such as the trim and ceiling with several slightly different shades of the main color. This will separate the elements without breaking them up and create the impression of a large space. Typically, the ceiling should be approximately 25% the intensity of the main wall’s color. Stripes. A bolder way to expanFeatured imaged space is with stripes. Vertical stripes can emphasize height, while horizontal stripes suggest width. Emphasize with black. To give your colors the most impact, frame them with something black. Whether it’s furniture, decoration, or a section of paint, black will provide a contrast to make the other colors pop. Surprise us with the ceiling. I mentioned earlier that the ceiling should be a slightly lighter version of the walls’ color. Well, like any “rule” in decoration, it’s not really a rule. If you’re feeling bold, paint the ceiling a bright, unexpected color. This will draw the eye upwards, emphasizing the room’s height. Okay! Fine. Here is an easy one. Here are some plain white walls we painted. Nice and easy. Yes it is another pricey home, but those are the ones that inspire us to take cool photos.